"Hi, my name is Ben and I'm a Bloggernacle-holic. It's been 30 minutes since my last look." I have a long history with the Bloggernacle. I honestly don't remember when I first started but it's been many years. I also have a rocky history with the 'Nacle. Sometimes I love everything I read, including the comments. Other times I want to punch it in the face and lose its phone number. In the end, though, I always come back. I think the trick is moderation, not necessarily with time but with content. There is only so much one can take of 100-comment-producing screeds. Sometimes you need to lighten things up. I'm not kissing tookus here, but that's one of the reasons I like MMM. There's a nice balance here. Not too long ago I decided that in order to participate in the Bloggernacle and maintain my own sanity, I needed an outlet. Thus Astute Doofus was born. 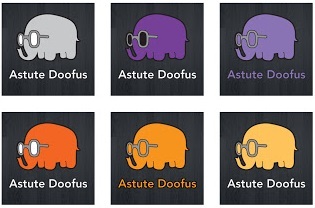 Astute Doofus is my lazy attempt at blowing off steam and having a good time. Admittedly, the attempt is crude and sometimes not well thought-out, but don't let that stop you from dropping in for a few minutes. I'd love to have you. Currently my plan is to post something every day until I run out of ideas or I quit the Bloggernacle for good (yeah right). But for now, please stop by and take a look around. As a side note, I am working on what will be the greatest post in internet history. When it goes up at Astute Doofus I'll let you know. It will be worth checking out.